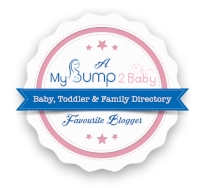 We moved into our house just over three years ago when I was pregnant with Freddie. Originally when we put the offer in on the house we were originally going to use the small back box room as a office for me to do my blogging and also a room for Andy to put his computer. I would use the room during the day and then Andy would use it come evening for his gaming once James was in bed. But Freddie arriving put the kybosh on that! Since Freddie tends to sleep in our room, but when he is at my parents house he shares a room with James. 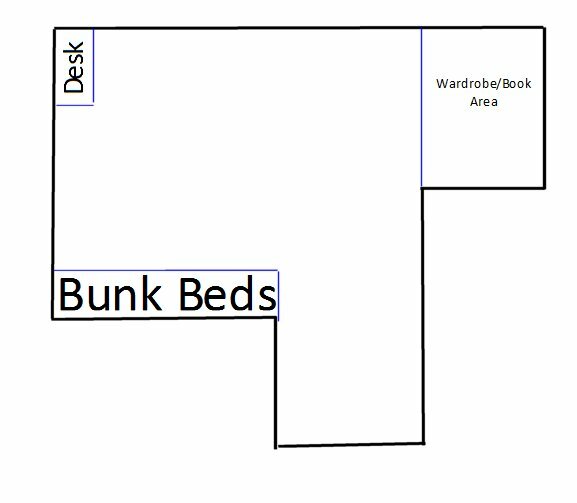 We have decided since James has a pretty big bedroom that we are going to install bunk beds in James current bedroom and move both boys in there together! We hope by doing this it will get Freddie out of our room and hopefully sleeping better! One of the things I would love to change on the room would be the windows! Our house does have double glazing but the windows are very odd. They seem to be different on every room of the house! I would love to change all our windows to sash windows. By doing this all the windows on the front and back of our house would be identical. I also think it would be easier to put a opening restrictor on sashwindows to stop the windows opening too far, especially in what will become the boys bedroom! So what are we planning on doing! 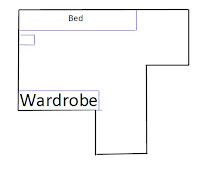 This is the current shape and layout of the bedroom as it is! The longest wall is the one where the big window is. This is where we currently have James bed as the room has a built in wardrobe, I do not like the fact we have the bed across the window as the radiator is under the window and the bed actually blocks all the heat coming into the bedroom. And because of where the wardrobe is, it makes the room very dark, so if we want to go in and check on James at night we have to virtually go right into the room. So the first thing we are going to do in the room is pull out the built in wardrobe and pull up the carpet. We are planning to lay laminate flooring as James is asthmatic and we know laminate will be so much easier to keep clean. 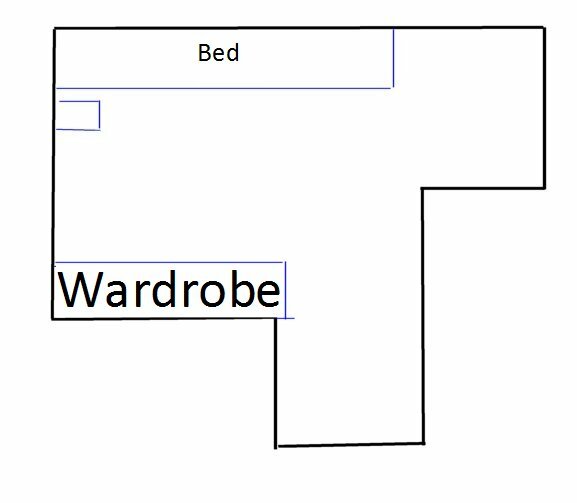 Where the wardrobe currently is there is actually a single plug socket on the wall, we are planning to get this changed to a double socket so we can have a wall mounted light on the wall as we are wanting to put the bunk beds we are going to get the boys on this wall! Where we currently have all James toys in the alcove which actually goes above the stairs we are going to turn this into the wardrobe area. We currently have all Freddie’s clothes in a two by four Kallax unit in his room. But once the boys move into the same room we will probably get another two by four Kallax unit or maybe get a four by four to store all their clothes in and maybe use the current two by for storing all the toys in. 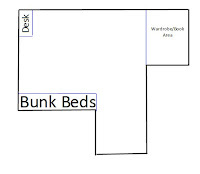 We will also try and put a desk into the bedroom as well. As now James is getting older he needs somewhere he can go and do his homework after school away from his little brother who is quite happy to watch Cbeebies! 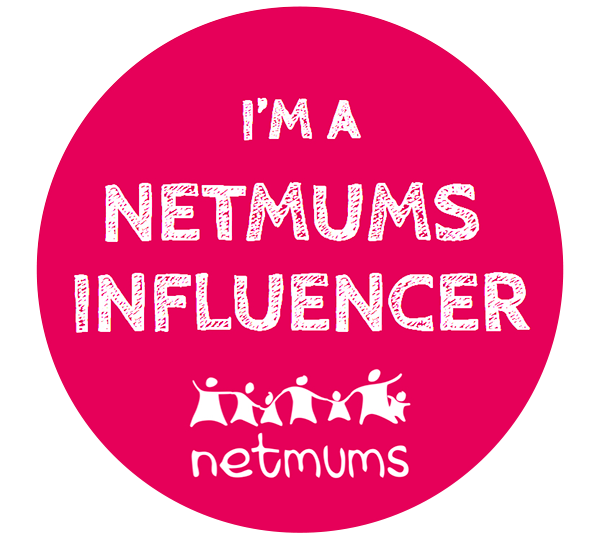 Watch this space for what we actually do to the room and how long it actually takes us! !